Anyone who thinks the "War on Terror" will be declared over anytime soon should think about this: the U.S. government just now removed Nelson Mandela from its official terrorist watchlist. 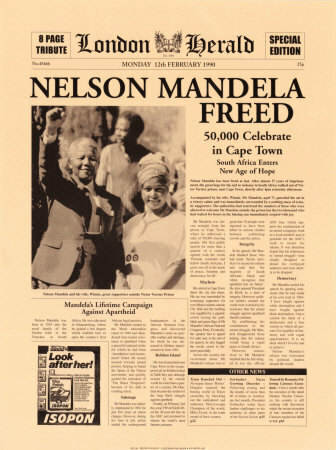 Mandela was put on the list along with other members of the African National Congress a few decades ago, back when the ANC was in fact using violence against the apartheid regime in South Africa. 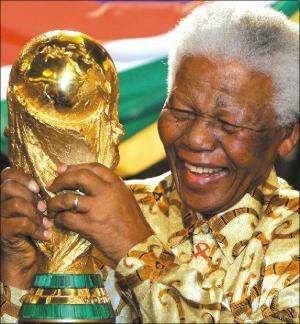 Mandela himself, though, was in prison from 1964 to 1990 (during which time he was probably not that much of a threat to the U.S.), and then was president of post-apartheid South Africa from 1994-1999 (same). You would think that maybe, say around 1993 when he won the Nobel Peace Prize, someone might have considered taking him off the list. But no. Mandela and other ANC members have been able to visit the U.S., but only by getting a special waiver — Condi Rice said the other day that she was happy to sign those but was a little embarrassed it still had to be done. H.R. 5690, which the president signed on July 2, makes the relevant provisions of the Immigration and Nationality Act (which we learned about just the other day after it kept us safe from Boy George) inapplicable to ANC members. So presumably they will now be taken off the list. Or will they? Who’s on this watchlist, anyway? According to the DOJ, it’s only "individuals who are known or appropriately suspected to be or have been engaged in conduct constituting, in preparation for, in aid of, or related to terrorism . . . ." Key terms there may be "appropriately suspected" or "related to," which seem a bit generic. But it would be understandable if they erred on the side of including a name, so long as there is a procedure for taking names off the list if necessary. Maybe this one-way effect (easy to add, hard to remove) is why the watchlist, it has been estimated, may now have more than one million names on it. The Office of the Inspector General found that, as of April 2007, the watchlist database contained "724,442 records" and "continues to increase by an average of over 20,000 records per month." At that rate, it would be hitting one million right about now. It’s a fair point that any terrorist would have multiple aliases, but unless they are really creative it’s not like there are 20 guys with 50,000 aliases each. And there is no question that there are thousands of names on the list that don’t belong there. "60 Minutes" reported in 2006 that the names on the "no-fly" section of the list included (in addition to Mandela) the president of Bolivia, who is not a terrorist, and 14 of the 9/11 hijackers, who clearly did qualify as terrorists, but who were also clearly dead. The good news: Osama bin Laden is on the list, so be sure to ring your call button if you see him sitting near you. He’s not supposed to be flying.